1. Cut stem off bottom of cabbage so that leaves will separate easily. Boil whole cabbage in a large saucepan for 30 minutes, or until leaves are cooked through. 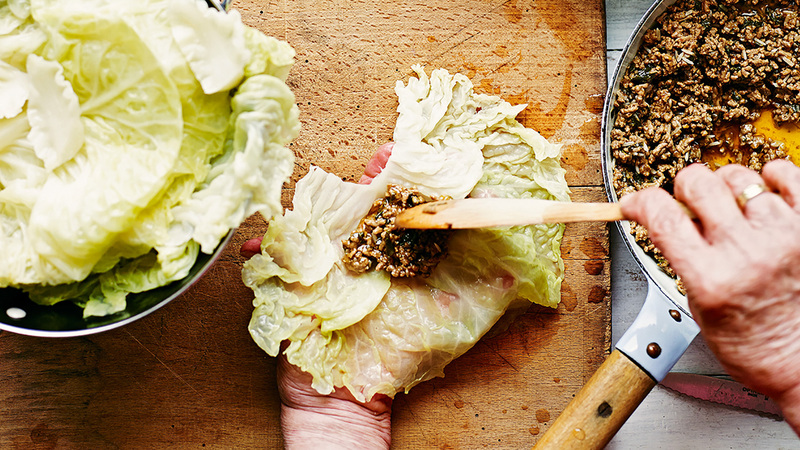 Take leaves off cabbage and remove from pan as they cook. 2. Meanwhile, prepare the filling by heating olive oil in a frying pan over medium heat and sautéing onion until translucent. Add mince and cook until lightly browned. Add parsley and tomato, then season with salt and pepper. Add water and bring to a boil, then reduce heat and simmer for 30 minutes. 3. Stir through rice and continue simmering for about 20 minutes, or until the rice is cooked through. Remove from heat and set aside until cool. 4. Fill one cabbage leaf at a time, taking care not to tear it. Place leaf on bench top and put 2 tablespoons of the filling at the bottom of the leaf. Fold in sides and roll up into a parcel. 5. In the same pot that the cabbage was cooking, place a couple of cooked cabbage leaves over the base then arrange the filled cabbage rolls evenly in the bottom of the pot. Continue adding the rolls in layers. Place a plate over the top of cabbage rolls to keep them in place. Pour hot water over plate covering rolls until water level reaches top of plate. Simmer on low heat for 45 minutes. 6. Remove pot from heat, remove plate and allow to cool slightly. 7. To prepare sauce, beat eggs lightly and slowly add lemon juice. Take a few spoons of liquid from the cabbage rolls and pour into egg and lemon mix while stirring. 8. Then slowly pour egg and lemon mixture into pot to form a sauce. 9. Serve warm with feta cheese and Greek salad.